Holyrood’s Brexit minister yesterday claimed there is an “overriding obligation” on Theresa May’s government to engage seriously with Scottish Government proposals to keep the UK and Scotland in Europe’s single market. Michael Russell warned that a hard Brexit which takes Scotland out of the free trade bloc would be a “national disaster” costing 80,000 jobs over the next ten years. This week, First Minister Nicola Sturgeon’s administration will publish its Brexit strategy, which will propose a “substantial transfer of new powers” to the Scottish Parliament. The paper, titled “Scotland’s Place in Europe”, will propose that Britain should remain in the single market even though the UK has voted for Brexit. It will also keep the option of holding a second Scottish independence referendum open. The document, to be published on Tuesday, will also set out how Scottish ministers believe Scotland could remain in the single market without the rest of the UK – a proposal that has ben rejected by a host of expert and political opinion including Chancellor Philip Hammond. According to Russell, it will be “the first serious attempt by any government in the UK to address the challenges thrown up by the Brexit vote”. 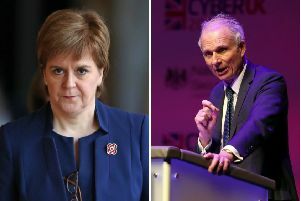 Just days after the UK referendum result, Sturgeon announced the creation of an expert group, the Standing Council on Europe, to advise on the best ways of maintaining Scotland’s links with Europe. Almost six months after the vote, which saw 62 per cent of Scots back Remain, the group – which includes specialists in legal, financial, business and diplomatic matters – will publish its proposals. Russell, minister for UK negotiations on Scotland’s place in Europe, said: “People in Scotland voted to remain in the EU by an overwhelming 24-point margin. He continued: “At the heart of our plan is a framework to keep Scotland’s place in the European single market. “A Tory hard Brexit threatens to cost Scotland 80,000 jobs over a decade. That would be a national disaster for Scotland. Russell also signalled that the Scottish Government paper would call for European powers to come to Holyrood, suggesting that areas governed by EU law such as aspects of environment, agriculture, fisheries and social policy should come under the jurisdiction of MSPs. “Our paper will include proposals for substantial transfer of new powers to Holyrood,” Russell said. “That reflects the fact that Article 50 negotiations will involve ‘repatriation’ of responsibilities from Brussels and there must be no attempt to use Brexit as cover for a Westminster power grab. “In addition, the plans we outline to maintain Scotland’s place in the single market will also require new powers to be devolved to Edinburgh. “We will table these plans for formal discussion at the joint ministerial committee meetings which will be held with the UK government. “However, there is an overriding obligation on UK ministers to engage seriously with our proposals. Scottish Labour’s Europe spokesman Lewis Macdonald said it was “very hard” to see how Scotland could be both in the UK and the single market, adding that his party would reject any proposal that put Scotland’s place in the UK at risk. “We have been calling for full transparency from the hationalists for months and we will scrutinise their plans when they are finally produced,” he added. “We have always said the Scottish Government should be part of the UK-wide negotiations on Brexit, and Labour wants the best possible deal for Scotland and the UK. Scottish Labour leader Kezia Dugdale has also said there should be a new Act of Union with a radical reshaping of our country along federal lines, and the Brexit result presents an opportunity for Scotland to take control of key powers. “We want a close relationship with Europe, which should mean access to the single market. But it is important to realise that access is different to membership. Britain is leaving the EU, and it is very hard to see any way in which Scotland could remain in both the United Kingdom and the single European market. Scottish Secretary David Mundell said: “We’ll consider the Scottish Government’s proposals carefully.